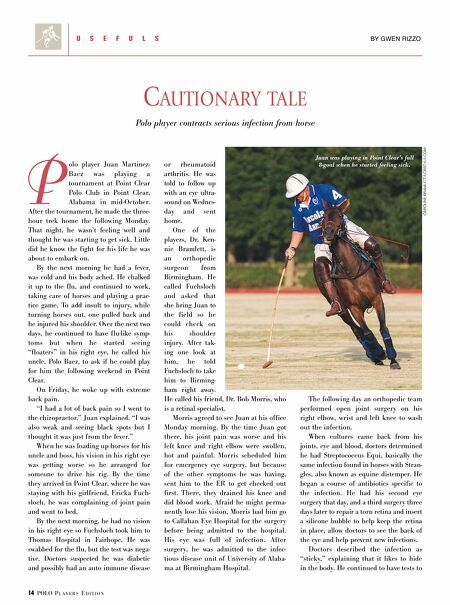 Polo Players' Edition is the official publication of the U.S. Polo Association. 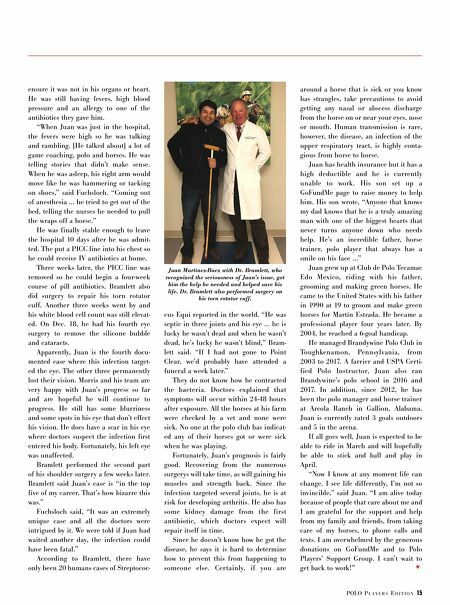 Dedicated to the sport of polo, it features player profiles, game strategy, horse care, playing tips, polo club news and tournament results. POLO P L A Y E R S E D I T I O N 15 ensure it was not in his organs or heart. He was still having fevers, high blood pressure and an allergy to one of the antibiotics they gave him. "When Juan was just in the hospital, the fevers were high so he was talking and rambling. [He talked about] a lot of game coaching, polo and horses. He was telling stories that didn't make sense. When he was asleep, his right arm would move like he was hammering or tacking on shoes," said Fuchsloch. "Coming out of anesthesia ... he tried to get out of the bed, telling the nurses he needed to pull the wraps off a horse." He was finally stable enough to leave the hospital 10 days after he was admit- ted. The put a PICC line into his chest so he could receive IV antibiotics at home. Three weeks later, the PICC line was removed so he could begin a four-week course of pill antibiotics. Bramlett also did surgery to repair his torn rotator cuff. Another three weeks went by and his white blood cell count was still elevat- ed. On Dec. 18, he had his fourth eye surgery to remove the silicone bubble and cataracts. Apparently, Juan is the fourth docu- mented case where this infection target- ed the eye. The other three permanently lost their vision. Morris and his team are very happy with Juan's progress so far and are hopeful he will continue to progress. He still has some blurriness and some spots in his eye that don't effect his vision. He does have a scar in his eye where doctors suspect the infection first entered his body. Fortunately, his left eye was unaffected. Bramlett performed the second part of his shoulder surgery a few weeks later. Bramlett said Juan's case is "in the top five of my career. That's how bizarre this was." Fuchsloch said, "It was an extremely unique case and all the doctors were intrigued by it. We were told if Juan had waited another day, the infection could have been fatal." According to Bramlett, there have only been 20 humans cases of Streptococ- cus Equi reported in the world. "He was septic in three joints and his eye ... he is lucky he wasn't dead and when he wasn't dead, he's lucky he wasn't blind," Bram- lett said. "If I had not gone to Point Clear, we'd probably have attended a funeral a week later." They do not know how he contracted the bacteria. Doctors explained that symptoms will occur within 24-48 hours after exposure. All the horses at his farm were checked by a vet and none were sick. No one at the polo club has indicat- ed any of their horses got or were sick when he was playing. Fortunately, Juan's prognosis is fairly good. Recovering from the numerous surgerys will take time, as will gaining his muscles and strength back. Since the infection targeted several joints, he is at risk for developing arthritis. He also has some kidney damage from the first antibiotic, which doctors expect will repair itself in time. Since he doesn't know how he got the disease, he says it is hard to determine how to prevent this from happening to someone else. Certainly, if you are around a horse that is sick or you know has strangles, take precautions to avoid getting any nasal or abscess discharge from the horse on or near your eyes, nose or mouth. Human transmission is rare, however, the disease, an infection of the upper respiratory tract, is highly conta- gious from horse to horse. Juan has health insurance but it has a high deductible and he is currently unable to work. His son set up a GoFundMe page to raise money to help him. His son wrote, "Anyone that knows my dad knows that he is a truly amazing man with one of the biggest hearts that never turns anyone down who needs help. He's an incredible father, horse trainer, polo player that always has a smile on his face ..." Juan grew up at Club de Polo Tecamac Edo Mexico, riding with his father, grooming and making green horses. He came to the United States with his father in 1990 at 19 to groom and make green horses for Martin Estrada. He became a professional player four years later. By 2004, he reached a 6-goal handicap. He managed Brandywine Polo Club in Toughkenamon, Pennsylvania, from 2003 to 2017. A farrier and USPA Certi- fied Polo Instructor, Juan also ran Brandywine's polo school in 2016 and 2017. In addition, since 2012, he has been the polo manager and horse trainer at Arcola Ranch in Gallion, Alabama. Juan is currently rated 3 goals outdoors and 5 in the arena. If all goes well, Juan is expected to be able to ride in March and will hopefully be able to stick and ball and play in April. "Now I know at any moment life can change. I see life differently, I'm not so invincible," said Juan. "I am alive today because of people that care about me and I am grateful for the support and help from my family and friends, from taking care of my horses, to phone calls and texts. I am overwhelmed by the generous donations on GoFundMe and to Polo Players' Support Group. I can't wait to get back to work!" Juan Martinez-Baez with Dr. Bramlett, who recognized the seriousness of Juan's issue, got him the help he needed and helped save his life. Dr. Bramlett also performed surgery on his torn rotator cuff.